Blast machine operators, as well as anyone else who may be exposed to the abrasive blast media, are required to wear appropriate safety gear, including abrasive-resistant clothing, leather gloves, eye and hearing protection, and a NIOSH-approved Type CE Supplied-Air Respirator. 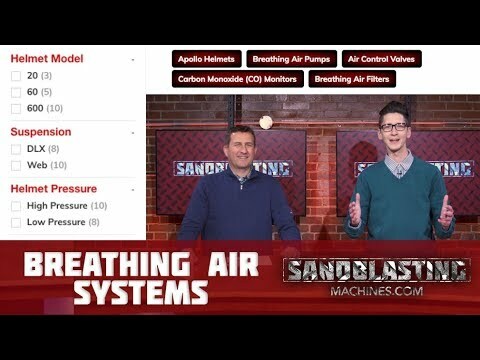 Because breathing air systems are critical in maintaining a safe blast environment, choosing the correct system and system parts is of the utmost importance. Our Clemco breathing air systems are available in High Pressure (HP) and Low Pressure (LP) respirator options. Air Control Valves control the air that enters these type-CE supplied air respirators. HP respirators must be connected to an air compressor capable of delivering Grade D breathing air. We recommend using a carbon monoxide monitor with HP respirator systems as an extra safety measure. Alternatively, LP respirators connect to an ambient air pump and receive air from the surrounding environment. We also carry the ambient breathing air pumps that are to be used with LP Apollo helmets. Grade D air has an oxygen content of between 19.5-23.5%, hydrocarbon (condensed) content of 5 milligrams/mᶟ or less, CO content of 10 ppm or less, CO₂ content of 1,000 ppm or less, and a lack of noticeable odor. If you have any questions regarding our Clemco breathing air systems and system accessories, please feel free to contact our experts at toll free number: 1-855-358-2858.